Cookies and pies abound during the winter holidays so why not mix things up with naturally sweet apple bar as a unique alternative? The crumbly top offers a familiar texture while the presence of rosemary and lemon blended with apples provides a flavor profile your guests won’t be expecting. Cut these bars up and gift them in a festive tin or on a plate wrapped with a bow to celebrate time together with family and friends in a healthier way and without another trip to the mall. Preheat oven to 425ᵒ F. Lightly coat an 8×8 glass baking pan with cooking spray or coconut oil. Combine oats, flour, lemon zest, and salt in a mixing bowl. Rub almond butter into the mixture with fingers until combined yet crumbly. With a wooden spoon, stir in ¼ cup maple syrup and vanilla extract until mixture is coated. In a separate mixing bowl, toss grated apple with lemon juice, ¼ cup maple syrup, and rosemary until coated. Press ½ the oat mixture in the bottom of the prepared baking dish. Spread apple mixture evenly over the oats. 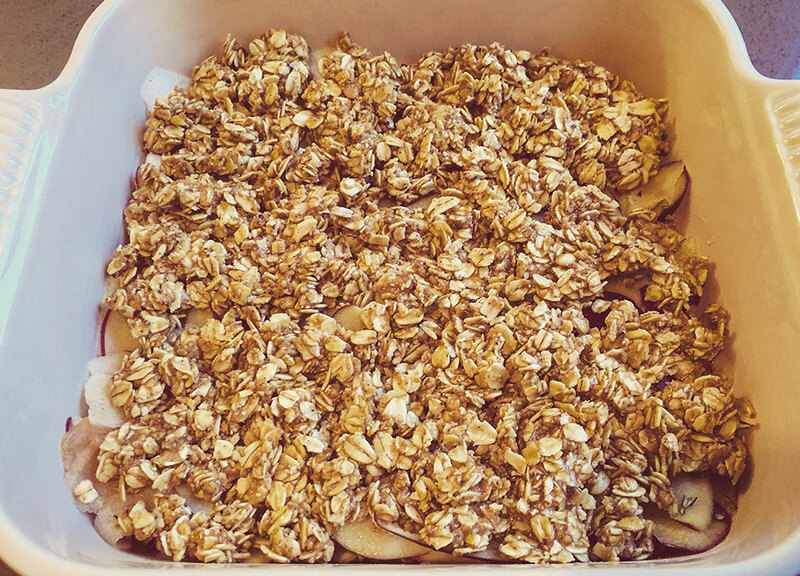 Press remaining oat mixture on top of the apple mixture and bake 18-20 minutes until golden brown. Cool completely and cut into square bars.